Although I’m absolutely obsessed with nail polish and buy a lot of it, I really try to avoid buying dupes. I can’t tell you how many polishes I’ve walked away from because I thought it was too close to a polish already in my collection. I have so many polishes that I can’t use most of what I have, so adding to it with colors that I already own and can’t wear that often doesn’t make too much sense to me. But this polish was an exception! I actually bought it BECAUSE I thought it was a dupe. I saw this at the mall at the beginning of September and the first thing I thought when looking at it in the bottle was “Wow, that looks exactly like Across the Universe!” But instead of an $18 price tag, it was $4.50 originally and then I got it for half off. Icing “Hey Sailor Boy” is a deep cobalt blue jelly with blue, green and silver chunky glitter and silver microglitter in it. I absolutely love this color combination. The Deborah Lippmann original is one of my favorite polishes of all time and one that I could wear all year round, for any occasion. So having a really cheap polish that is insanely similar is amazing. Formula is really nice too. The glitters are very dense and cover the nails nicely. You don’t have to manipulate the glitter to make sure the entire nail is covered, nor do you have to fish glitter out of the bottle. The formula is a little thick, but that’s normal for these types of polishes. Also, the dry time is pretty fast as well. The polish dries with a little bit of a gritty texture, but that is true for all polishes like this. 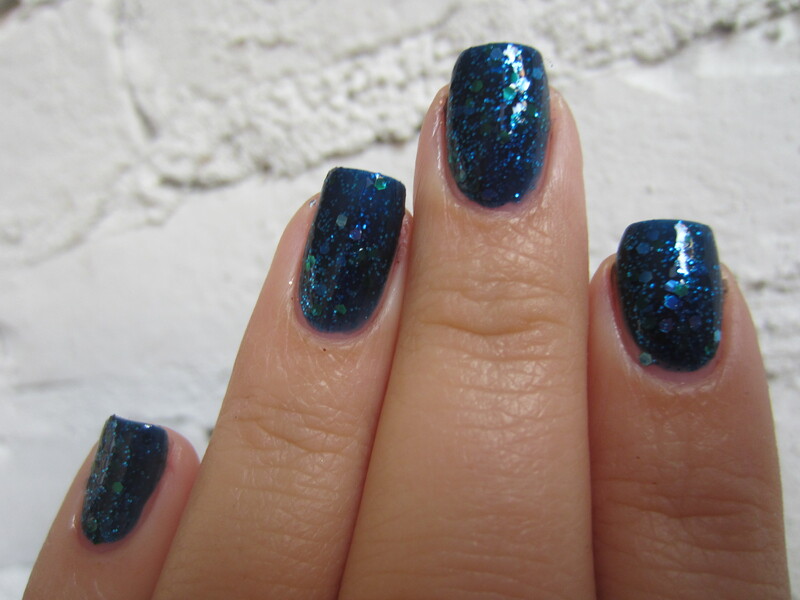 I have already taken pictures of a comparison post between this polish and Deborah Lippmann “Across the Universe”, so that is why I am holding off on letting you guys know my thoughts on whether this is a dupe or not. Stay tuned for that post in the very near future! What do you guys think of this polish? Do any of you have it? Do any of you have any Icing polishes? Love love love this – it’s really pretty Holly! Looking forward to seeing your comparison photos. i do too! blue and green are probably my two favorite colors to wear! this one is really nice too especially for how cheap it is. do you have an icing store near you? i know i’ve been on the fence about whether to stop buying sally hansen. and i know OPI and Essie both have the same issue that they themselves don’t test on animals but their parent company does. mac is the same way, its cruelty free here but not in china because chinese law requires animal testing. i don’t want to support animal testing but its hard for me to boycott just because the company that owns a cruelty free brand does. Hey Sailor Boy is beautiful. Who sells it? awww thank you!! and Icing sells it! i don’t know where you’re from but icing is an accessory store in the USA, so hopefully you have access to it because they have really cool and really cheap polishes! That’s really beautiful. I don’t have any Icing polishes but that’s almost enough to make me go brave the mall to see if they’re having a sale! Wow gorgeous colour! So sad they don’t sell the brand here! i’ve never had any essence nail polishes but i’ve had amazing luck with their makeup. its essence “blue addicted” and i just looked up swatches, they’re almost exact dupes!